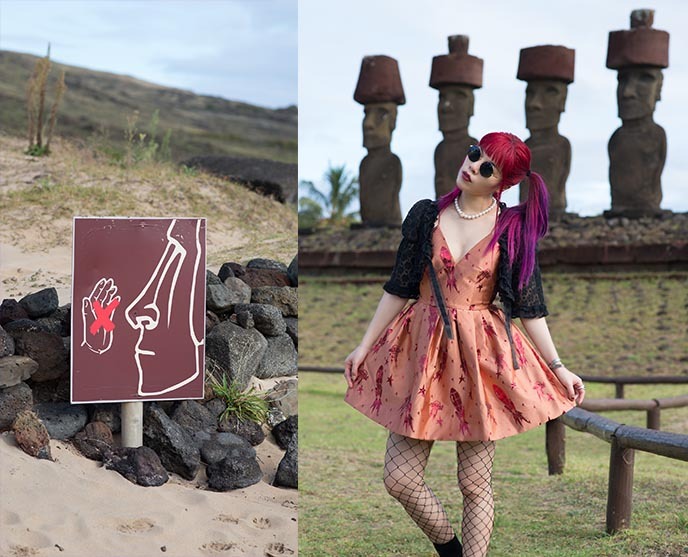 Travel guide to mysterious Easter Island: Moai statues, aliens & cannibals! Day tour with guide & driver. 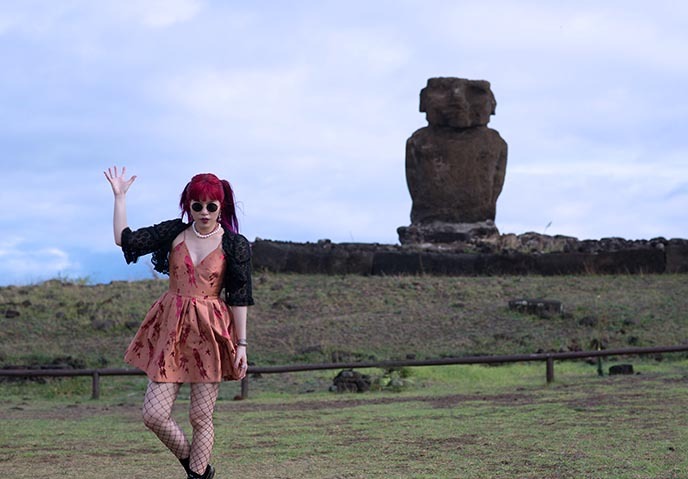 Greetings, my fellow aliens… I’ve arrived on Easter Island! 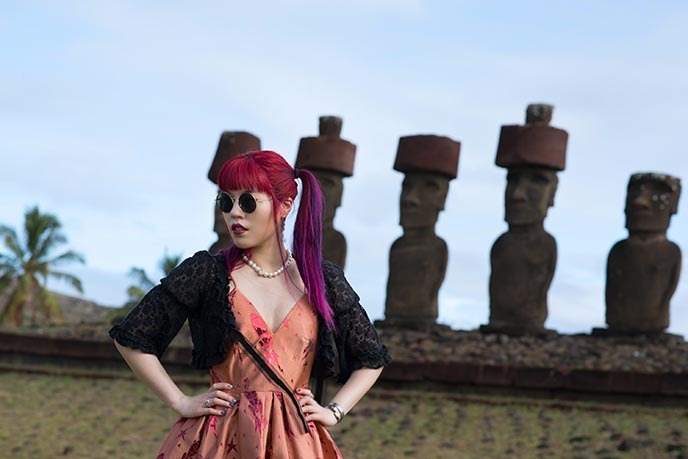 Since childhood, I’ve dreamed of visiting this mysterious island of moai.  How did these stone-faces come to be, on a tiny hidden isle? Did extraterrestrials have anything to do with these strange statues? 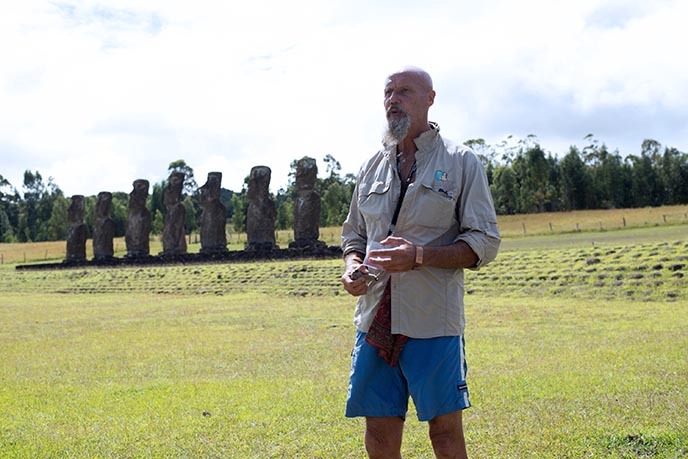 Follow me to Easter Island, and we’ll discover the ancient rituals and culture of the Rapa Nui. 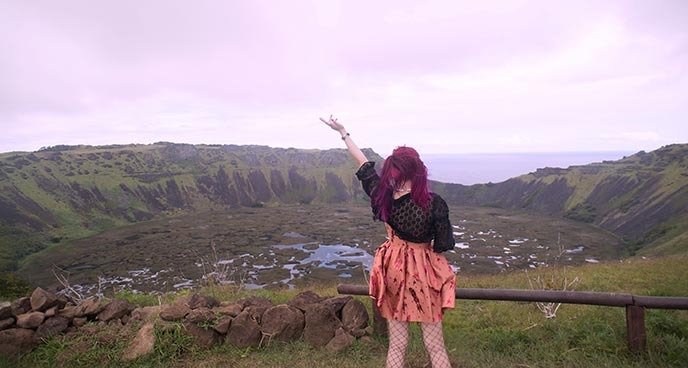 “Isla de Pascua” is basically in the middle of nowhere. It’s an island the size of Manhattan, located in the southeast Pacific Ocean and far from any other civilization. 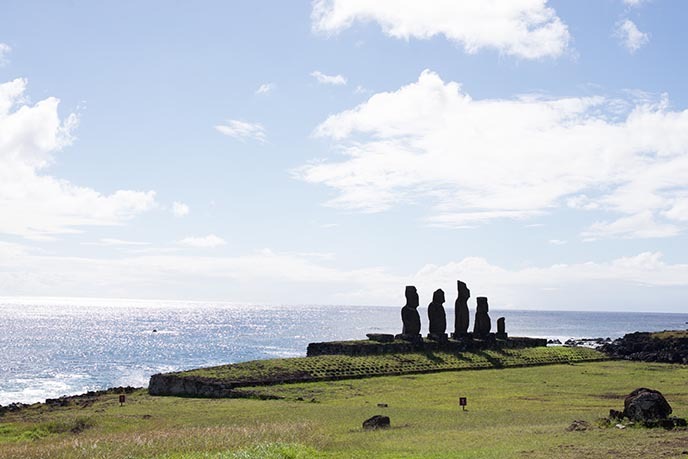 In one sense, reaching Rapa Nui is easy — because there are only two flights! 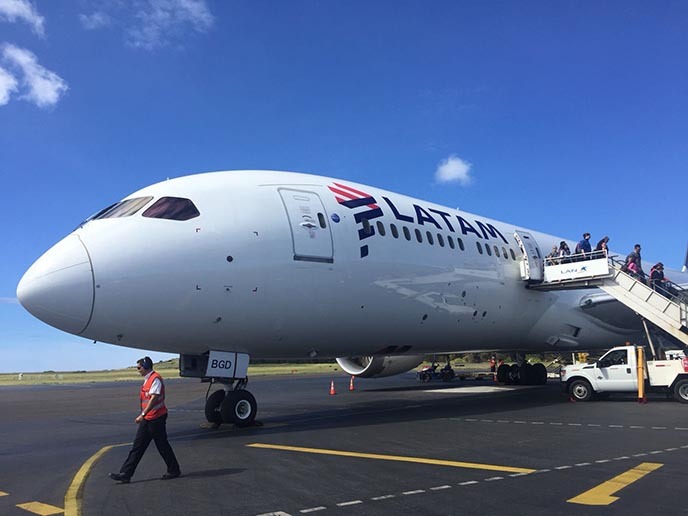 You can fly from Bora Bora, Tahiti or Santiago, Chile on LATAM Airlines. I did the latter, and it still took 5.5 hours each way. 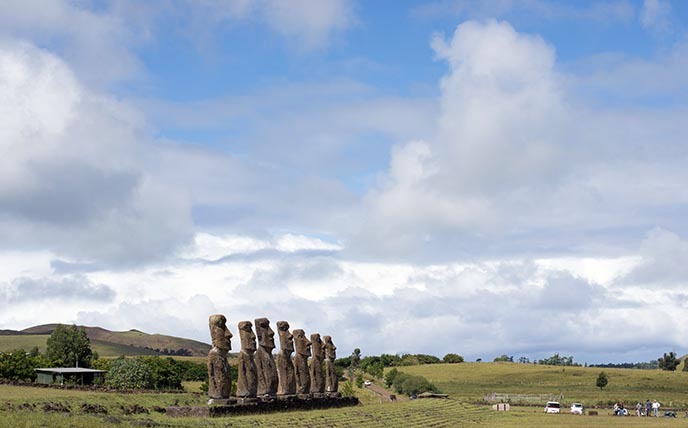 Because of the remoteness, Easter Island is a place very few people get to visit. On the plus side, the lack of mass tourism has preserved the alien vibe; as I went around, I felt as if I were exploring a new planet. Although Easter Island is tiny, the main attractions are spread out and can’t be accessed by foot. Many people rent bicycles or cars, but I’ve never gotten on a bike in the history of this blog, and I didn’t want to stress about driving directions and potentially crash into a stone head! Instead, I highly recommend booking a custom or small-group tour. 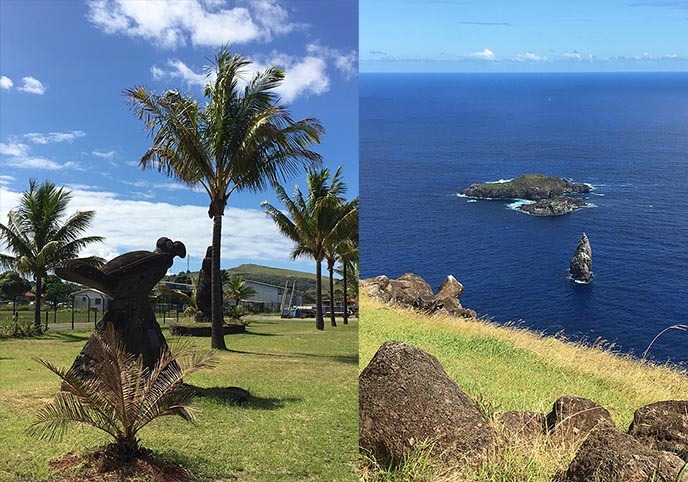 We’re very glad we did a day-trip with Easter Island Travel, as we only had a few days to explore. Our expert guide drove us to all the major sites, knew the best hours / spots to take stunning photos, and riveted us with tales from ancient times. 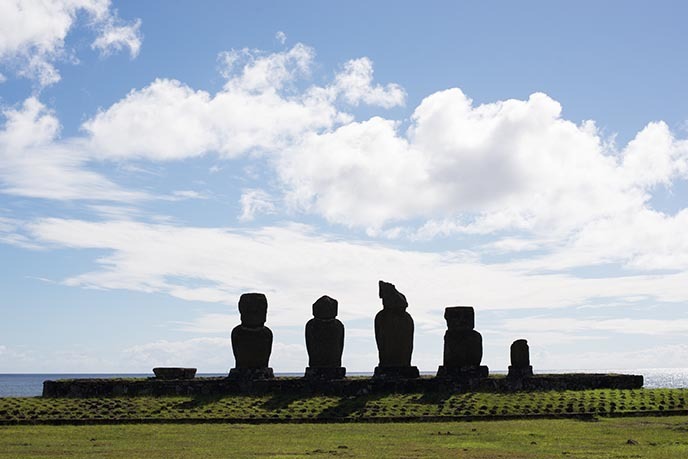 We joined the Journey of Legends tour, which covers all the highlights of central and southwestern Rapa Nui. Every tour is capped at 8 people maximum, so we had plenty of flexibility, and our guide was always available to answer questions. After a morning pick-up from our hotel, our first stop was Ahu Nau Nau. 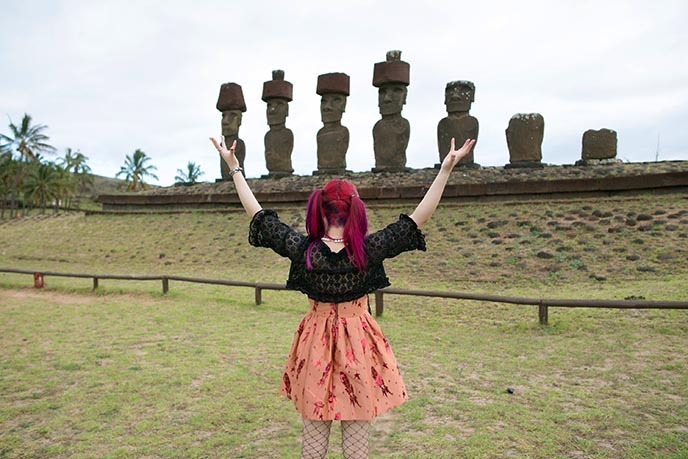 What a feeling, to see these stone statues up-close… I greeted them with a Hail Moai! 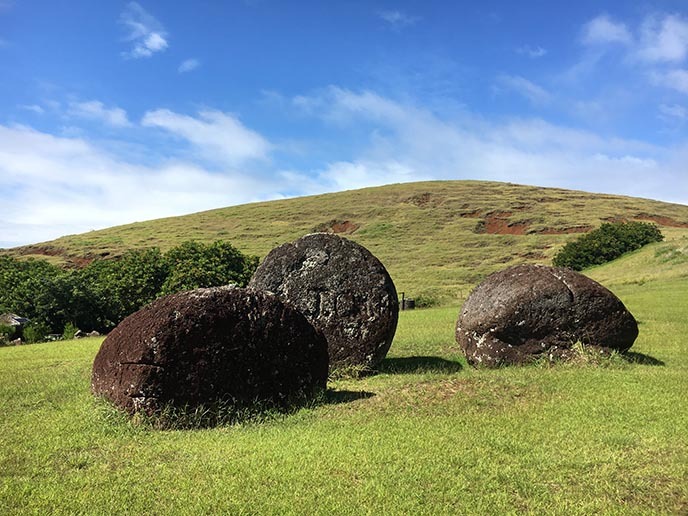 What’s the deal with the moai on this isolated island? 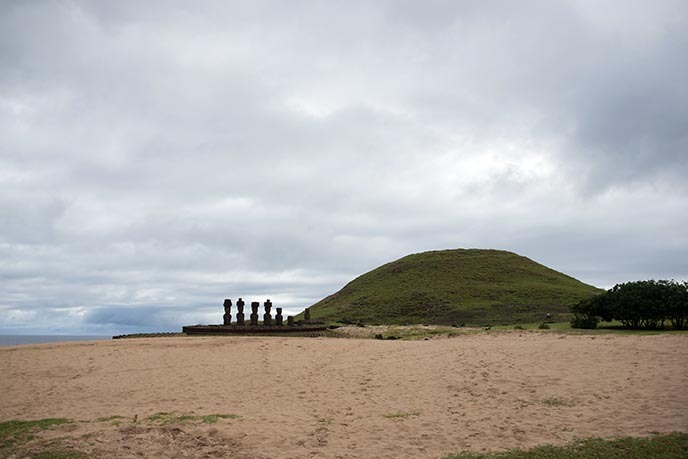 Between 1250 and 1500, the Rapa Nui carved over 900 monolithic figures (representing ancestors and their sacred power), and placed them on “ahu” or platforms. The faces have a district, minimalist flat look that is recognizable worldwide. It’s remarkable that ancient tribes were able to complete such advanced feats of engineering. To this day, there remain many unanswered questions about the moai. No wonder conspiracy theorists ponder whether aliens put them there. When you’re in such an “out there” destination, you’d might as well dress the part. 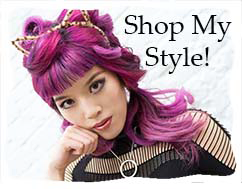 Outfit details: my black fishnets are from UK Tights, black coverup by Moi-meme-Moitie, sunglasses Edwardson Eyewear, and white pearl necklace Alex Streeter. 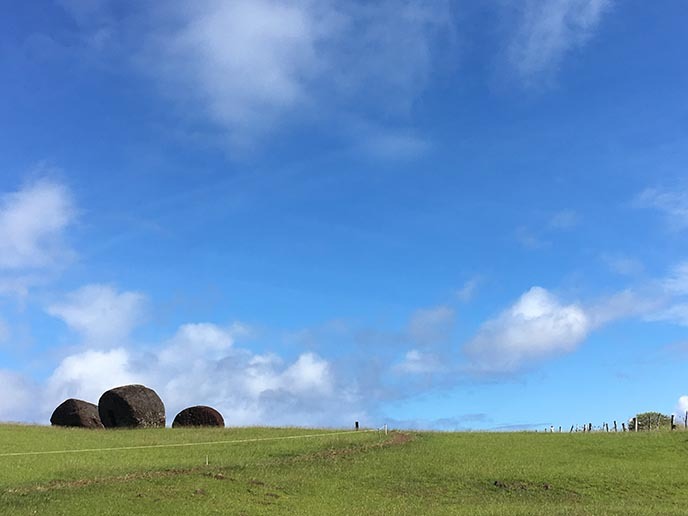 The moai are found all over Isla de Pascua; some are half-finished, or lying down as if they are sleeping. Many were placed in rows on “ahu” platforms, like these six. 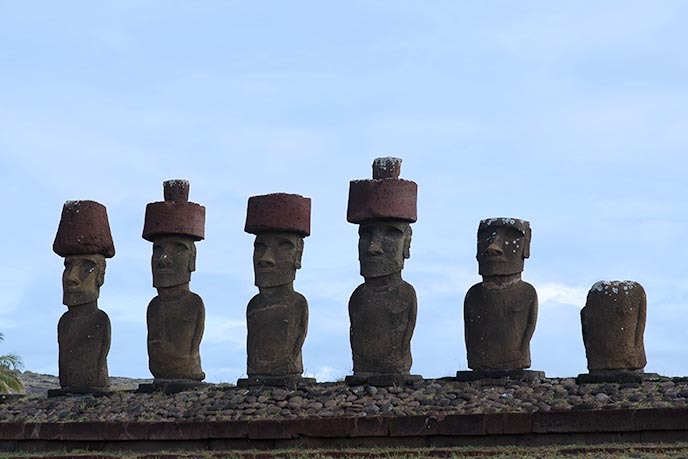 I asked my Easter Island Travel guide — are the stone people wearing hats? Researchers actually think that these “pukao” represent topknots (the hairstyle) — although they look more like cute hats to me, especially the conical one. The pukao are made of red scoria, a more fragile volcanic rock, which is why many of them broke over the years. Ahu Nau Nau is the best-preserved moai site on Easter Island. After 1722, Rapa Nui society began to collapse (due to clan clashes, lack of resources, and the arrival of European explorers). During these conflicts, all the stone-faces were toppled. Many broke beyond repair, but these ones were left buried in the sand, which fortunately protected them from erosion. 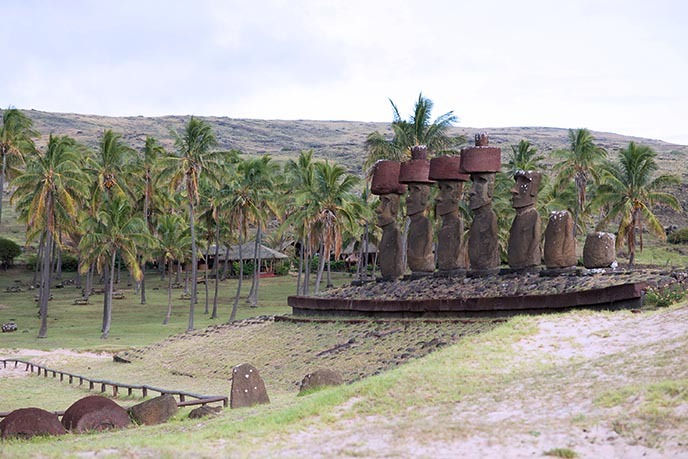 These statues are located at Anakena beach, the most lovely stretch of sand on the island. It’s one of only two beaches on this otherwise rocky terrain. Travellers and locals come here to swim and sunbathe on the white coral sand. 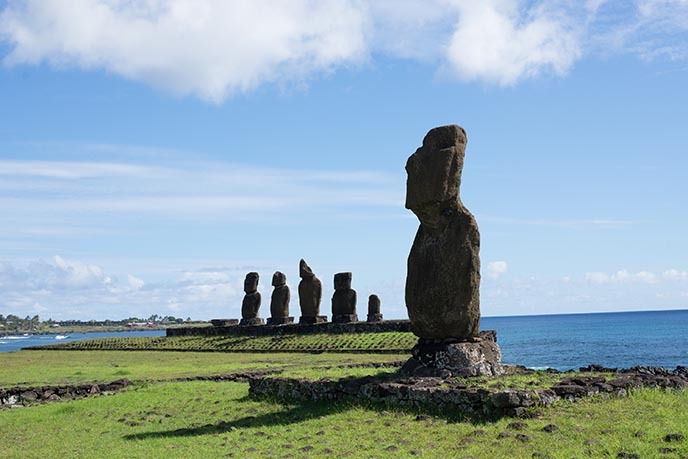 Up close, you can see the differences between the moai; each has his own distinct vibe and “personality.” Some think they were carved to commemorate ancestors, and customized to represent that individual. The backs of these moai have geometric relief carvings, depicting depict a belt, spirals and symbols. These decorations might represent tattoos or body paintings. My dress is House of Holland, shoes Underground England. Onward to Puna Pau, a quarry inside a small extinct volcano crater. 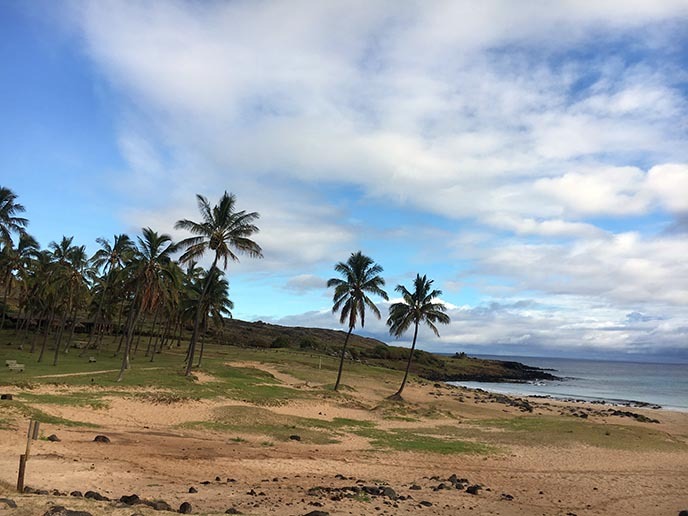 All of the pukao (moai red hats / topknots) come from this location, on the outskirts of Hanga Roa. Easter Island’s bizarre landscapes are partly due to the lack of trees and shrubs. 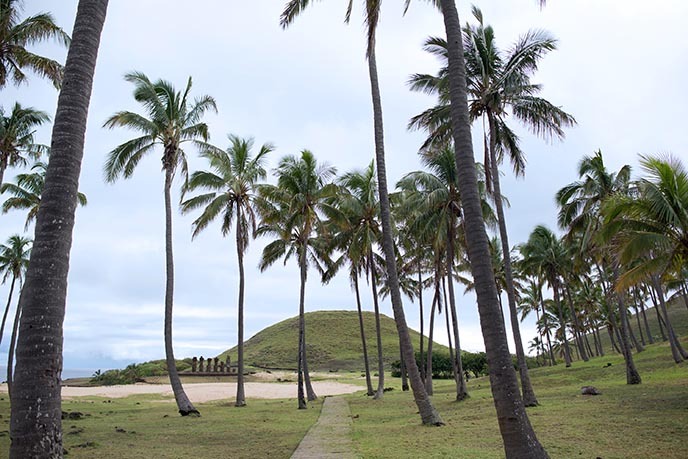 The Rapa Nui eventually cut down all the native palms, as the island had limited resources; sadly, the depleted ecosystem led to the collapse of their civilization. Today, rainwater still drains quickly through the porous volcanic soil, so these dry conditions are not ideal for vegetation. Another fun fact: I became enamored with Easter Island after playing “Super Mario Land,” which features moai-like enemies and landscapes! The curving green hills beneath blue skies and clouds look like a backdrop from a Mario Bros. video game. I half-expected a TokoToko to sprint into me, or a Batadon to hop onto my head. 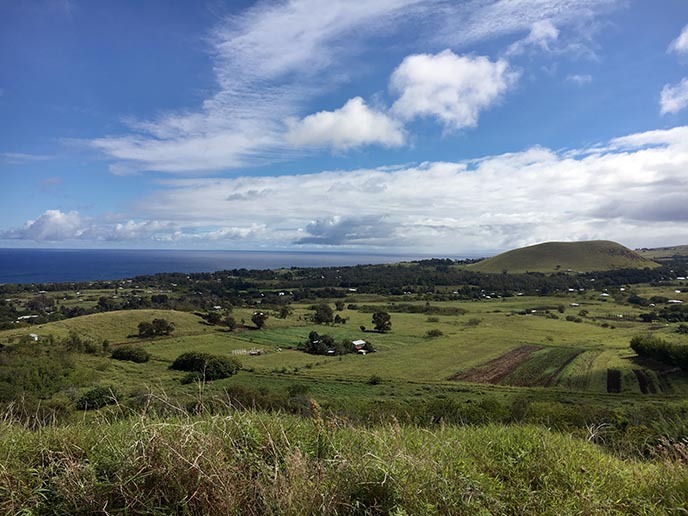 From Puna Pau, you’ll get this spectacular view of the strange land and ocean at all sides. We’re in the South Pacific, so it’s hot out here. Be sure to wear sunglasses and lots of sunscreen, and hydrate when you’re out on a day tour. I also wore a hat, or hid beneath a parasol between taking photos! Our small group piled back into the van, and we headed to Ahu Akivi: the only monument with moais that look out towards the ocean. All of the other statues face inward, as if they are watching over the villages and locals. 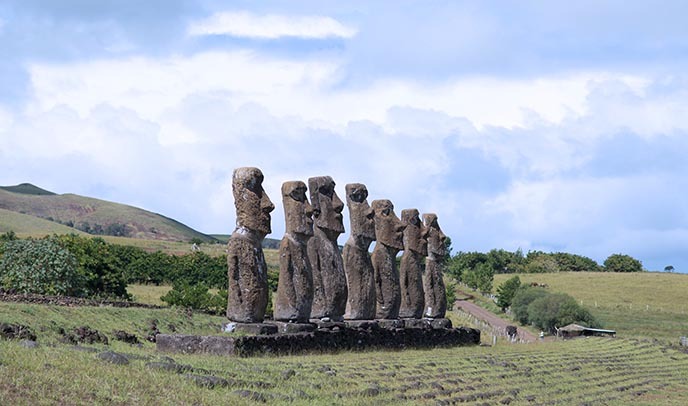 In contrast, these seven moai face outward at the water, for unknown reasons. Legend says they are helping seafarers find the island, or that they are seven loyal men waiting for their king to arrive. My rocket and stars dress isn’t the only celestial element out here. 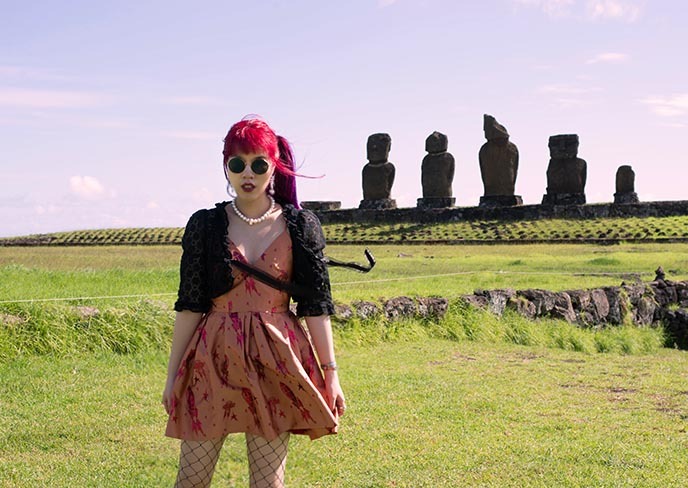 The 16th century Aku Akivi is also an observatory: the row of moai face sunset during the Spring Equinox, and have their backs to the sunrise during the Autumn Equinox. Amazing how these tribes were able to make such advanced calculations. One of the biggest mysteries of Easter Island: how did the Rapa Nui move these huge, heavy moai into place? After all, the tallest statue erected on the isle was 33 feet high, and weighed over 90 tons. 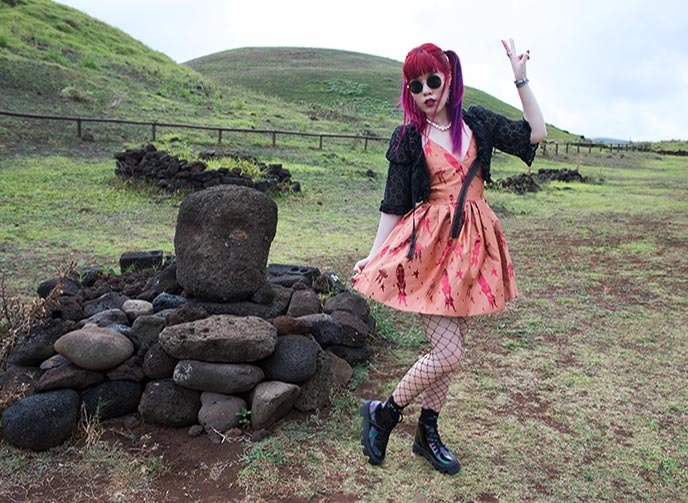 Legends tell of the gods (or aliens) infusing divine power into the moai, which allowed them to walk! Where does the name “Easter Island” come from? In 1722, Dutch explorer Jacob Roggeveen was the first outsider to arrive on these shores (unfortunately but not surprisingly, the encounter resulted in bloodshed). His ship landed on Easter Day, hence the name. 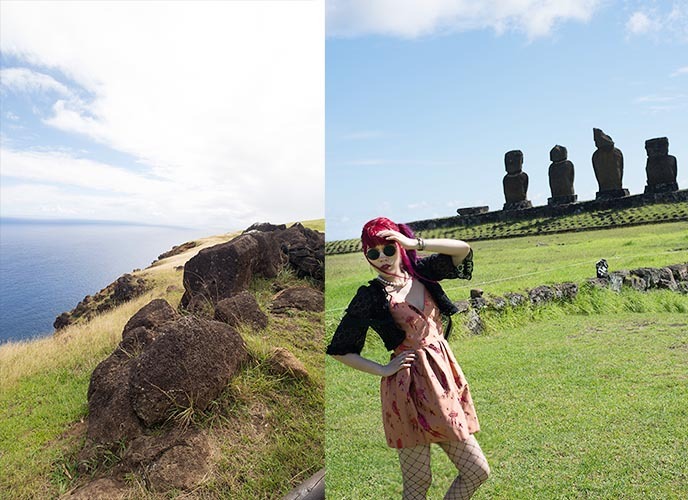 As you can see, we covered a lot of ground during the Easter Island Travel day tour. 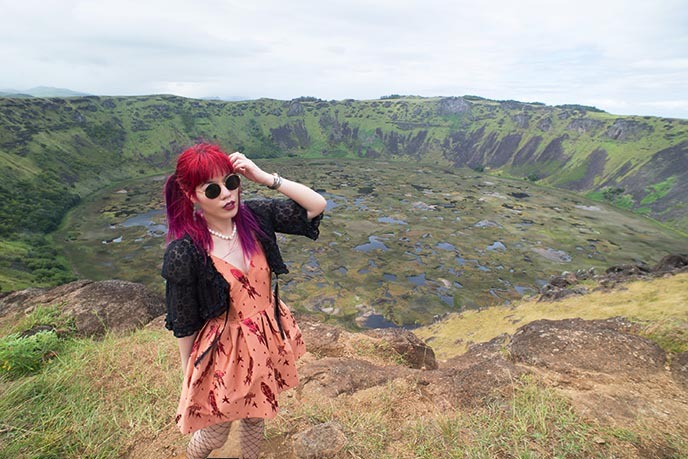 Shane drove us to Rano Kau crater, one of the most stunning natural sites here. In ancient times, this was an important source of drinking water, as rainwater accumulated inside the volcanic caldera. Today, as you can see, the 1.5 km long lagoon has a murkier quality. Rano Kau is essentially a giant greenhouse. These conditions encourage the growth of diverse vegetation. The lake is only about 10 meters deep, and covered in totora reeds and other species. This is also where scientists discovered Rapamycin, a compound derived from a soil bacterium found only on Easter Island. It’s an immunosuppresent, and so far has been used to prevent organ transplant rejections and treat a rare lung disease. Today, body hackers are experimenting with rapamyacin as a supplement for longevity. 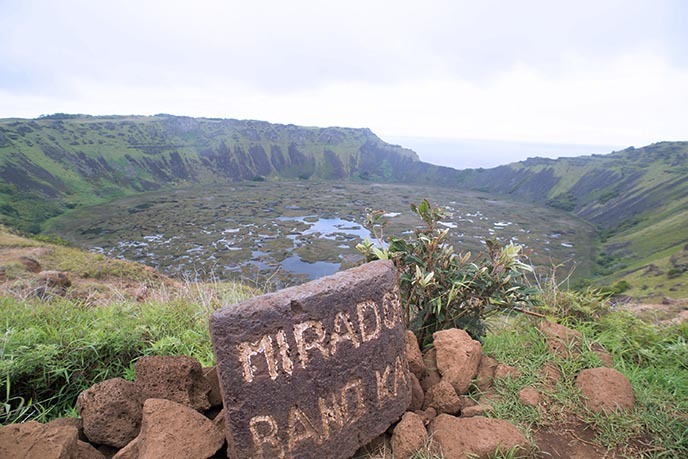 Orongo, the ceremonial village and site of the birdman competition, is located next to the crater. 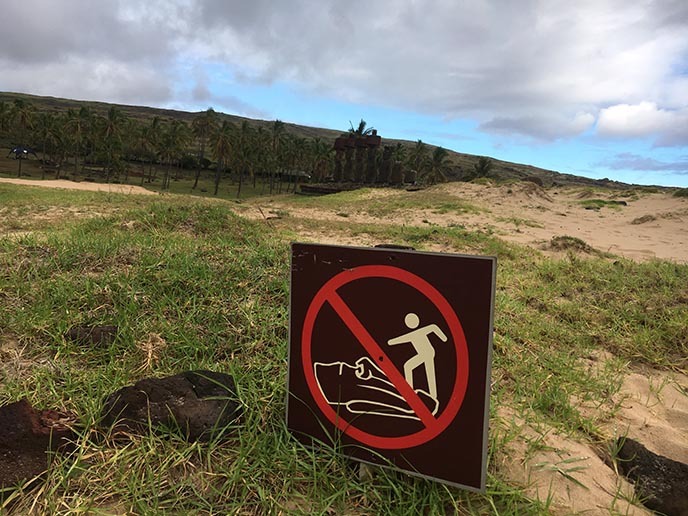 After the Rapa Nui abandoned the moai statues, they took on a new cult / belief system called “tantaga manu.” Every year, they held a fierce competition where young men would try to capture the first sooty tern bird egg from the islet of Mota Nui (the largest island on the right). The race was very dangerous, with perilous cliffs and sharks waiting in the waters. Once the winner had obtained the first egg, he’d swim back and be crowned ruler of Easter Island. We walked around the 50 oval stone fortresses, where the participants and their sponsors lived while waiting for the right conditions to start the Birdman competition. When the new king returned, he’d stay hidden in one of these houses for a while, gathering his powers. 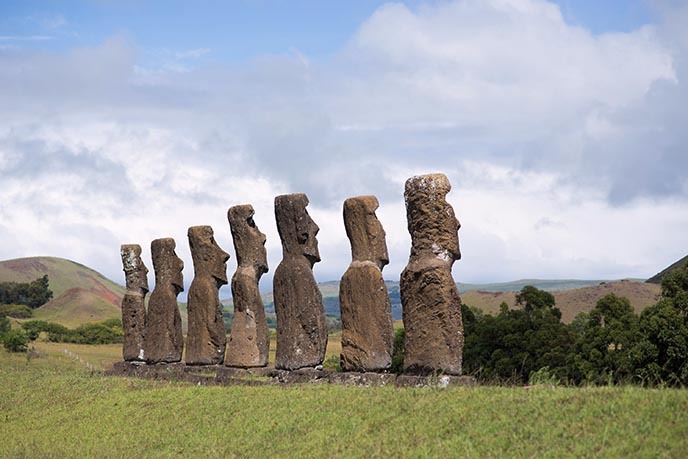 Today, the moai are back as the rulers of Easter Island! We ended our tour at Tahai, one of the oldest settlements with excavated remains dating back to 700 AD. 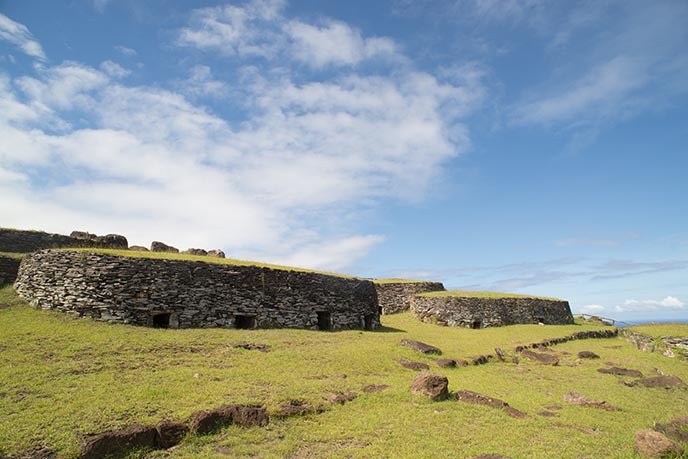 Tahai consists of three ahu platforms, and is one of the most popular attractions since it’s located near the present capital of Hanga Roa. 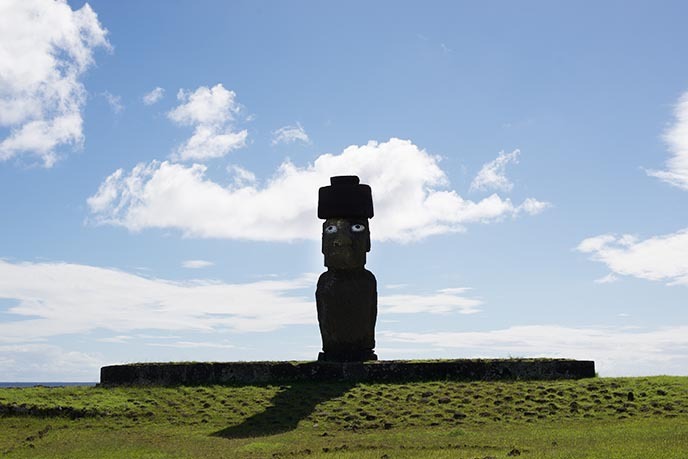 “I always feel like somebody’s watching me…” Yes, the moai originally had eyes. This is Ko Te Riku, a re-erected figure with replica eyeballs that give him a slightly creepy look. In 1979, archaeologists discovered that the moai were designed to hold coral eyes, with either black obsidian or red scoria pupils. 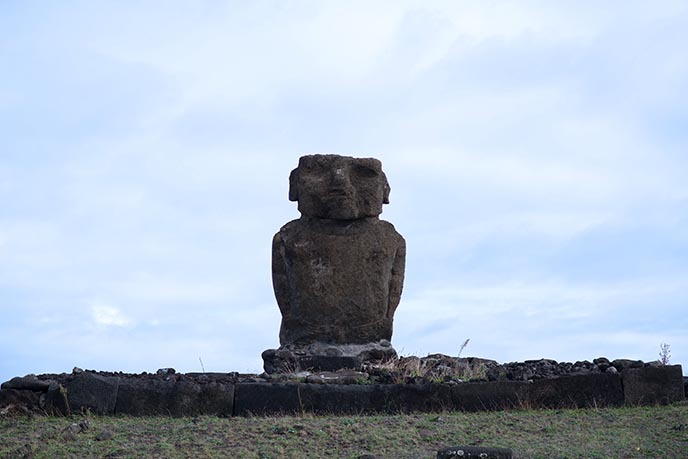 We are still learning unexpected things about the mysterious Rapa Nui. At Tahai, you can also visit a small but interesting anthropological / historical museum called Museo Antropologico P. Sebastian Englert. The site also features Ahu Vai Uri, which translates to dark water or green water. 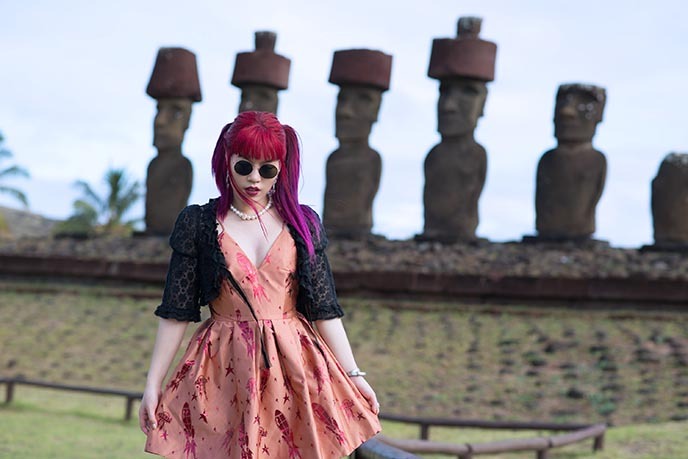 Its construction dates to 1200 AD, and these five restored moai are a sampling of the different carving styles over the years. Tahai also holds the tomb of William Mulloy and his wife Emily Rose. He first came to the island in 1955, and led the most thorough archaeological research of Easter Island in modern times. 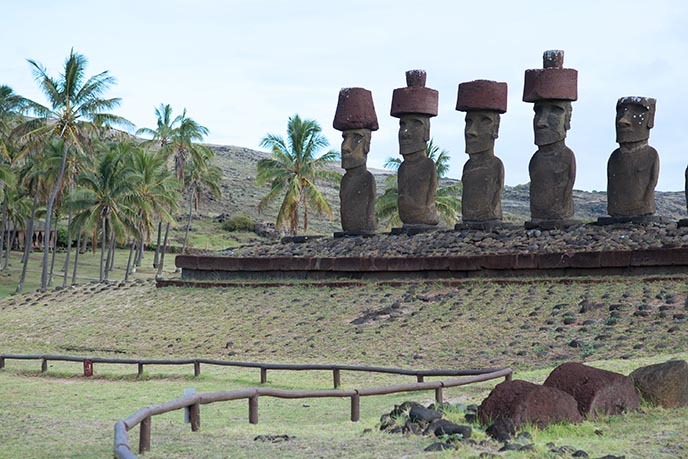 If you ask me, Easter Island is a real life Mario Land! As someone obsessed with obscure cultures and alien-like destinations, this trip was a dream come true. LATAM Airlines is the only route here (from Santiago or Bora Bora). I found it to be a smooth, timely flight with lots of horror movies on their entertainment system to keep me busy. 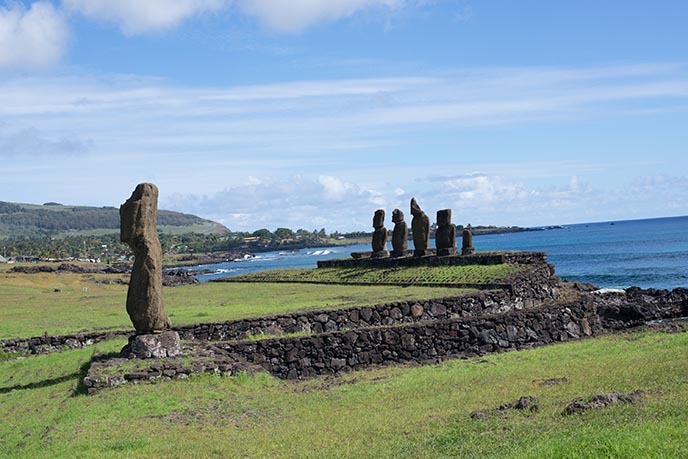 Easter Island Travel’s tours are the best way to see the island. 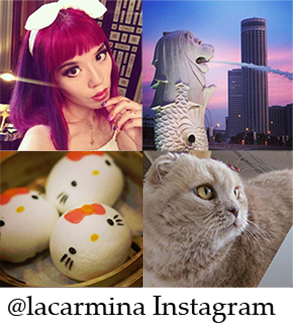 In addition to culture / history journeys, they offer fishing, surfing, a boat trip to Birdman Isle, airport transfers, custom tours, you name it. We’re glad we had a knowledgeable guide to take us to these magical spots. A last “hail” to the moai. 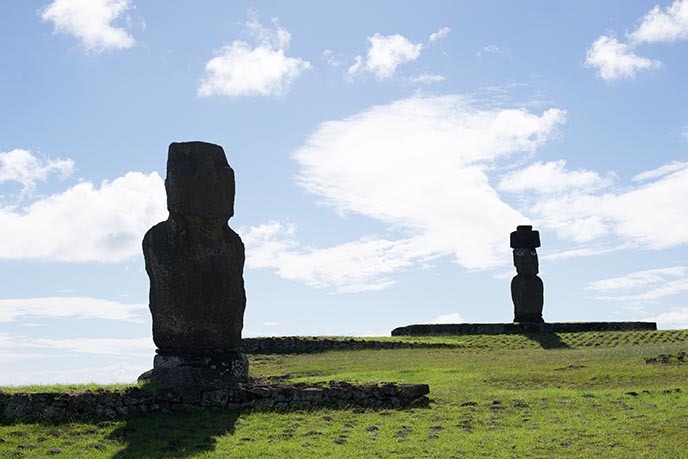 If you’re intrigued by Easter Island, check back as there are two more articles to come! It was a 10/10 destination for sure! 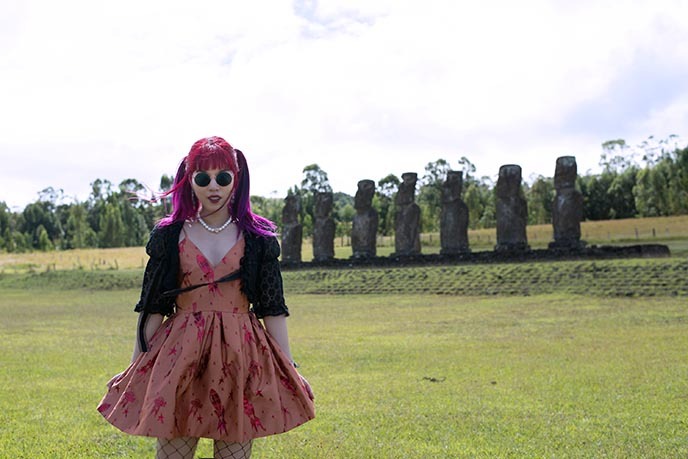 This is a dream to me too, I cannot believe you are here on Isla de pascua! I can’t believe I made it here either!! definetely suppose, that this is one of the most significant presentations of the #houseofholland dresses ever. 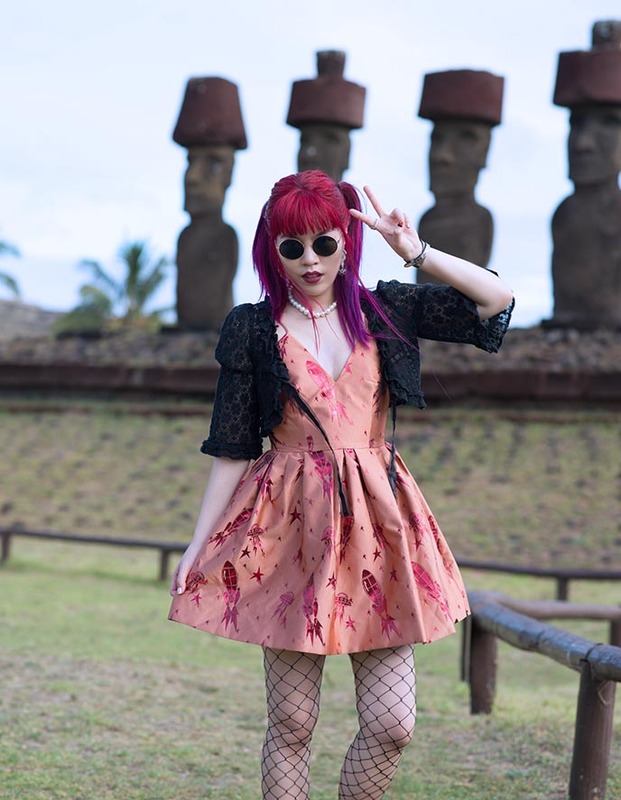 It’s my current favorite dress, and was perfect for the location! oh my gosshs you’re on easter island! Thanks for all the kindness over the years!!! Incredible. 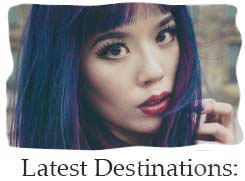 Your travels are so amazing!